Moo Shoo is a female manatee who visits Blue Spring State Park in the winter. She was first identified in 2010. Moo Shoo is a female manatee who visits Blue Spring State Park in the winter, and she was recently added to Save the Manatee Club’s Adopt-A-Manatee® program. Moo Shoo was first identified in 2010. 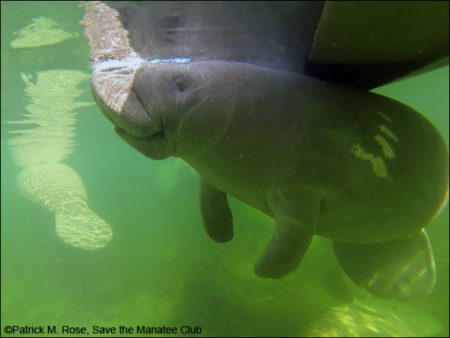 Wayne Hartley, Save the Manatee Club’s Manatee Specialist, says it’s possible she was visiting the park even earlier, as there were 19 calves who could not be identified in the 2009 – 2010 winter season, and Moo Shoo may have been one of them. Researchers identify manatees by their scar patterns as they study and record their behaviors. Unfortunately, by the next manatee season, Moo Shoo soon had some scars. She had a superficial scrape on the left edge of her tail and three prop slashes with a skeg slash in the middle of her back from a boat hit. She also had white marking along the left edge of her tail. “With such a young manatee, I was sure these would heal to invisibility,” said Wayne. “Initially she was known as “S5/10,” and that meant she was a manatee I thought I would only be able to follow for one season, and I would not know her if she came back the next year. But by the next season, Moo Shoo came to Blue Spring with her white markings intact. Wayne was even able to discover a postage stamp-sized scar on her left lip. She then became “U14/11,” meaning she was marked well enough for him to possibly identify her in the future, and at the end of the season, she received the name “Moo Shoo,” and her Blue Spring number “BS668,” signifying that she is officially known as a manatee who visits the warm waters of Blue Spring State Park in the winter. Moo Shoo loves to nudge the research canoe. In this photo, you can also see the scars that researchers use to identify her. Since that time, Moo Shoo has continued to return to Blue Spring each winter. Mandan also came back with his mother as a yearling, but he does not have marks that will make him easy to identify in the future now that he is weaned and on his own. During the 2017 – 2018 manatee season, Moo Shoo brought another calf to the park, which would put her at a three-year birthing interval. And she seems to have matured a bit. Wayne reports that Moo Shoo was a much better mother with this calf and did not seem as interested in the research canoe as much. 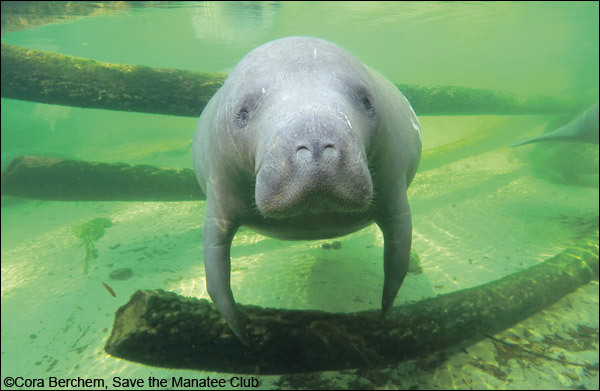 Each person who adopts Moo Shoo will receive a full-color photo, biography, and adoption certificate, as well as a membership handbook and subscription to The Manatee Zone, a newsletter featuring updates on the adopted manatees when they are sighted, and Paddle Tales, Save the Manatee Club’s bi-monthly eNewsletter. For more information about adopting Moo Shoo, go to Save the Manatee Club’s Adopt-A-Manatee® page, or call 1-800-432-JOIN (5646).